We were crazy busy and placed bunches of pups in December. Thank you to everyone who visited and chose us for their new family member. We still have a few pups looking for their new forever homes. Check the links to the right to see what is available. We are open on December 24 until 4 pm! If you are still considering a pup, we are available until 4 pm on Monday. We will re-open at 9 am on Wednesday. In the past, many people chose to wait until a few days after Christmas to take a new pup home. This is a good idea as the hustle and bustle has started to die down and you can be a little more relaxed. So, whatever you decide, before or after, we still have beautiful pups to choose from. I hope that everyone has a chance to enjoy the family that surrounds them and feel the blessings of the season. Merry Christmas to all! Still time to select a new pup! We have placed many pups in their new homes the last few weeks, but still have a very nice selection for you to choose from. If you want a Christmas puppy, you can select one and with a 50% deposit I can hold it till Christmas Eve for you without a hold fee. Check the links for availability. Lots of cutie pies waiting for you! Boy, aren't we joining the Big Time! Anyone in the Rochelle area who listens to 102.3 all holiday music at this time can hear our radio ad. Very exciting for us to be able to advertise. A whole bunch of new pups are ready to be seen and go to their new homes or be held for you for Christmas. We have quite a few appointments scheduled at this writing, but we still have plenty of openings and pups waiting for you to see. Check the links to the right to see what is available and get the "skinny". If you would like to visit, just give us a call. 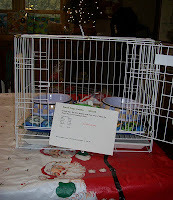 Don't forget, we also have crates, crate packages and some gift giving ideas for that favorite canine in your life. Love my new office!!!! - Send me pics please! It is still not exactly the way I want it, still have to recover an old seating booth that my dad made in the 50's and still getting stuff up on the walls and working out the kinks of arrangement, but I sure love working out here with a great big desk and not stuff all over my kitchen counter tops. Great pups available, check out the links. Don't forget that I can hold a pup up until 7 pm on Christmas Eve for you with a 50% deposit and an additional $25.00 hold fee. For those of you who have gotten a pup from me and still follow this blog, if you have a holiday pic of your pup and want to share it with me, I sure would love that. I am starting a big bulletin board with kind notes and pictures that I have received over the years. Hope the holidays don't stress you out and that everyone can keep in mind what is important in our lives not just this month but throughout the years. Anyone who knows me, knows that this building put an unbelievable stress on my husband and I, not only mentally but financially, but I can honestly say that life is good, we are blessed with wonderful children and grandchildren and I am thankful.
. . . and ready for me to start using! Three years is a long time but we are very happy with the results. Starting next Friday, 11/23 we will begin showing in the back building. It is a stone building at the back of our property that is completely handicapped accessible along with a handicapped restroom. I also will have the cage combos ready for sale. If you purchase the whole combination it saves you a few dollars. 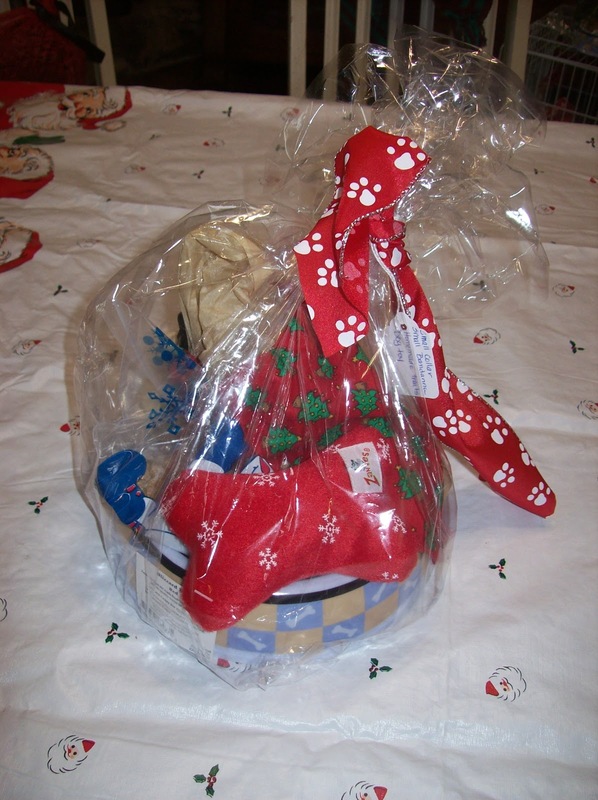 We also have gift baskets and accessories that will be available. We are available to show pups today and tomorrow and then are heading out of town for the holiday. We will resume showing pups again on Friday, November 23. Give us a call anytime (even while we are out-of-town) to schedule a showing time. The closer we get to Christmas the quicker my appointment calendar gets filled. Now that the new litters are ready to go to their new homes, we have decided to discount the pups that are in the 12 week age range. Therefore, the following are on sale: 3 Shih Poos - $375 each, 1 Cocker Spaniel Female - $375. Check the links to the right for more information. I already have been getting calls for Christmas pups, so decided to start that list going. New pups will be available, Saturday, November 10, Saturday, November 24 and Wednesday, December 12. If you come to visit and put a deposit on a pup for Christmas, I can hold the pup for you until Christmas Eve for an additional $25.00. Saturday, November 10: MinPins, Cockapoos, Yorkipoos, Schnauzers, Poms,Schnoodles, Shih Tzu & Yorkies. 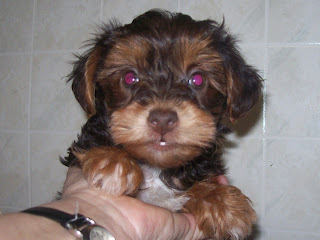 Saturday, November 24: Maltese, Yorkipoos, Morkies, Bichonpoos. Wednesday, December 12: Teddy Bears, Westies, Poodles, Shihpoos, Peketzus & Yorkies. On the links to the right I have posted more information on each breed and pictures of the pups that will be ready November 10. It is too early for pics on the other two groups of pups as they still look like little furballs. I will keep the links updated with new pics as soon as I can get some good shots. I have mixed feelings about bringing a pup home for the holidays. Ideally, it is best to take a pup home before the craziness hits, however, in order not to be a hypocrite; as I insisted on having Santa bring a pup home on Christmas Eve when my kids were little, I understand that you might want to do the same. That is why I allow pickups up until 7 pm on Christmas Eve. With that being said, if you don't have to have a "Christmas" pup, I have wonderful pups ready for their new homes right now and as you read above new pups ready for their new homes throughout the month of November. I would love to see them placed before the holiday hits! Check the links to the right for availability and info. New Puppies Ready for their New Homes! - Price Increase starting November 10! All the puppies on the site are now ready to be seen and go to their new homes. Let me know if you would like to come by and see them. On another note . . . unfortunately beginning November 10, I will have to raise my prices. I use Eukanuba puppy food, which is a very good nutritional diet for the puppies. They have just come through with a considerable price increase. Immunizations in the last year also had quite a substantial increase as well. I have been absorbing all the additional expenses I have had for the last few years, however, have crunched the numbers and have found that I am going to have to raise my prices. Therefore, starting with the new litters that will be ready in November, the prices will be going up approximately $20 per puppy. Sooooo . . . if you are thinking of a pup in the next month or two, you might want to come see what I have now. As, the pups that are on the site right now are the last pups that will be offered at the lower prices. Appointment schedule getting full for this weekend! This week I am in Tennessee, helping my sister recover from wrist surgery. Bob is available in the evenings to show the pups that are ready at this time. All of the new pups will be ready to be seen starting Saturday afternoon. I have already scheduled quite a few appointments, so if you are interested in coming out, give me a call so we can coordinate a time. Links to the right give you more info on what is available. Any questions, just give me a call. Therefore, I need to make room in the puppy house. I will discount any pup on our site $50.00. 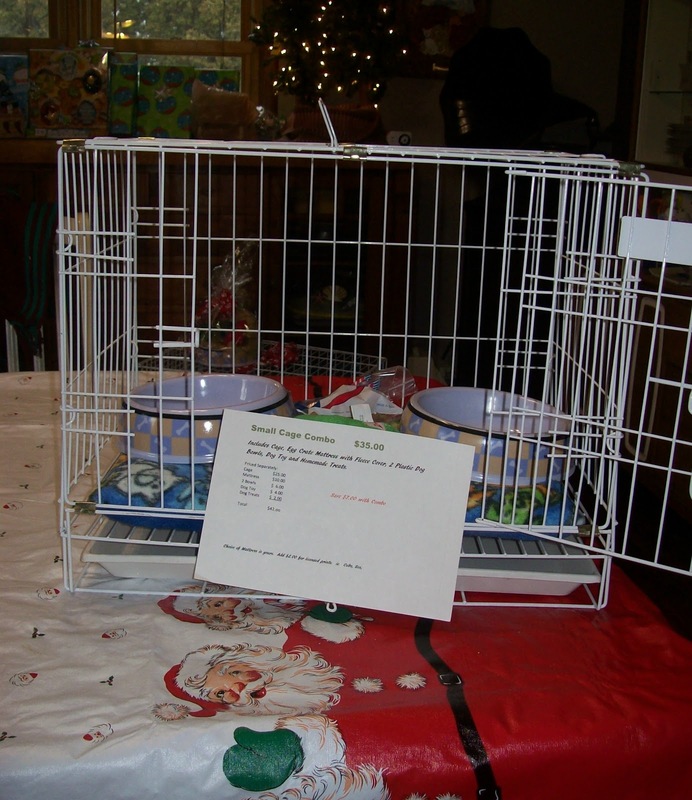 You must come to take one home by Saturday at 3 pm. The sale will end at that time. The only pups that I will not discount are the French Bulldogs that I am taking deposits on and won't be ready till November 3, the 2 Chorkies and the Yorky. The three Frenchies that are ready to go now can take the discount. Let me know if you would like to visit and what you would like to see, love and give a new forever home too! The new pups that will be available beginning the afternoon of October 13 are as follows: Cavachons, Maltipoos, Morkies, Teddy Bears, Shih Tzus, Bostons, Yorkipoos and Shihpoos. I already have people on the waiting list for several of these pups, so if you are interested, please make sure to contact me to get on the list. An explanation of how my waiting list works and more info on the different breeds are posted on the links to the right. Hope to see you soon and thanks for visiting my site. Wow, the heat has been grueling, hope everyone is staying cool and making sure their canine companion isn't left out in the heat too long. It can be deadly. Please be careful and make sure there is shade and plenty of water. I have decided to reduce the price on a couple of the pups we still have left from our litters born in March and early April. Check the links to the right to get more information. I spent quite a bit of time getting new pics of just about every pup available. A couple pups did not completely cooperate, so I will have to work on those this week. But for the most part, I got some good shots. Normally, we are available almost every day of the week to show pups. However, we will not be showing pups tomorrow, Sunday, July 1. Our daughter is throwing a big birthday party for our granddaughter who turned 5 on Wednesday. Gosh, I cannot believe how fast time flies. A few weeks ago, I told her she was breaking my heart by growing up too fast and could she just please stop growing. She looked at me and her exact words were: "Nana, that is life, just get over it." Arrgh what happened to that sweet little toddler? Anyway, we will be available all day Wednesday, the fourth of July, so if you would like to schedule an appointment for sometime next week, just shoot me an email or leave me a voice message and I will get back to you asap. Great News! The family that originally had adopted the little white schnauzer and then had to bring him back due to medical problems has been able to take him back home! Yay for you Bogie and Yay for the medical problems not being as bad as anticipated. I will have two schnauzer pups available this weekend, if that is the breed you are looking for along with several other new litters. Just check the links to the right to see what is ready right now and what will be available for visiting beginning Friday. As always, if you have any questions, just give me a call. Still have some great pups available for you to take home today. Check the links to the right to see them. Don't forget about the schnauzer who needs to be rehomed. His date of birth is 2-22-12. He is such a sweetie. He had to be brought back due to a serious medical condition that had nothing to do with him, they just felt they could not care for him properly. I am only asking $250 for him, he has his CKC registration papers and all of his shots except rabies. He loves other dogs and people. Still have 3 little tiny orange kitties that need a home too! We are available all weekend, give us a call. They are litter box trained and at the "oh so cute" age. Let me know if you would like one or maybe 5? Last but not least, I have 10 kitties that need to find homes. They are FREE!!!! Most of the orange ones are boys and the darker tortoise shell are girls. Wowee, what a day. Quite a few pups went to their new homes today. We still have very nice pups to choose from. I try to keep the site as current as possible. So check the links to the right to let you know what we still have available. Thanks to everyone who visited today. All of the new litters of pups are ready to be seen and most of them are ready to go to their new homes. They, of course, are all little darlings! Check the links to the right to get more information on the specific breeds and what is exactly available. I try to keep all the information pretty current. Give us a call to set up a time to visit! Our new pups will be ready to be seen next Saturday, so I need to make space. Therefore, I am discounting the cockapoos to just $350.00 each. Give us a call. We are available all day on Sunday. 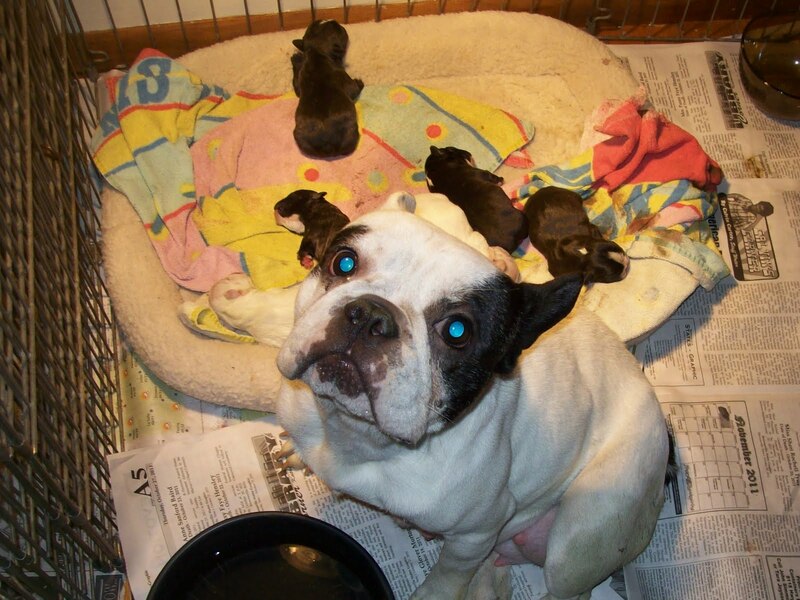 Got the pictures from my cousin of the upcoming litters that will be available beginning Saturday, April 28. I have already begun scheduling appointments, so if there is something you are interested in calling, do not hesitate to give us a call. Check the links to the right for more info on the specific breeds. Thanks to the two wonderful couples that visited this weekend from Lombard and Bolingbrook. They chose to bring a Frenchie into their homes and I know the pups have wonderful lives ahead of them. 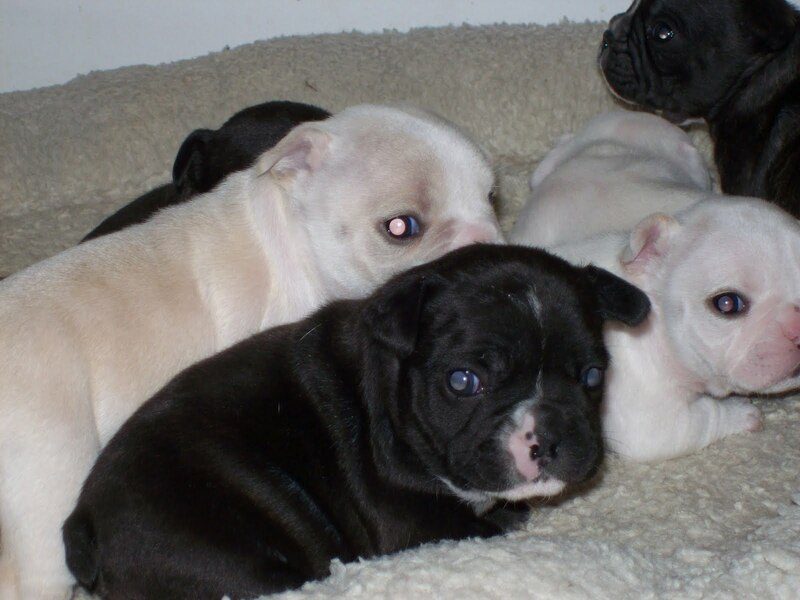 That means, that we do not have anymore Frenchie pups available at this time. We still have several wonderful pups ready for their new homes right now. We have 1 Morky, 3 Cockapoos, 1 Cavapoo and 2 Poodles available. Within a few days I should have pictures of the upcoming pups that will be ready for their new homes starting Saturday, April 28. 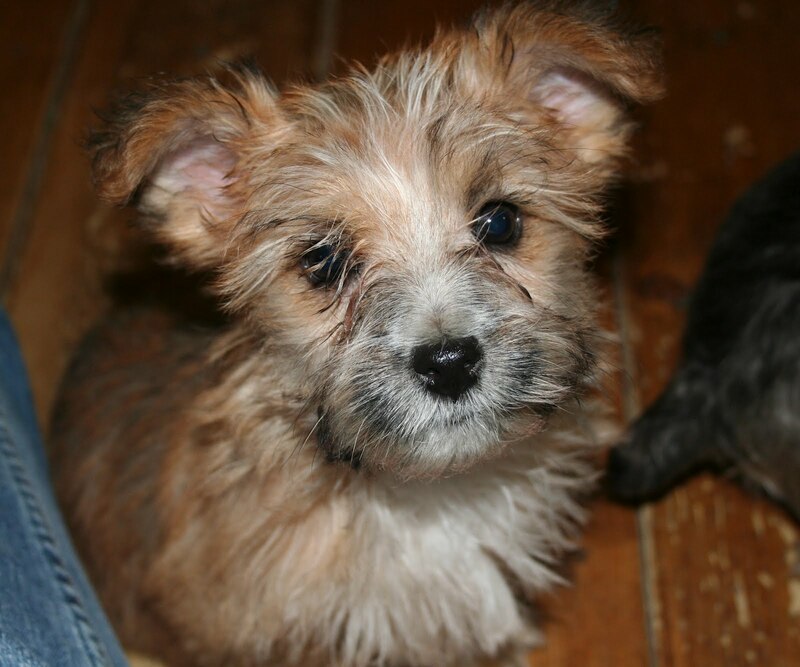 We will have Shih Tzus, Schnauzers, Shih Poos, Schnoodles, Morkies, Teddy Bears and Westies. If you are interested in any of these pups, give me a call, so you can get on the waiting list. Snapped a few new pictures today. I got some better shots of the chocolate color poodle, check the link to the right to see him and several good shots of the last male French Bulldog pup from Phoebes litter that is available. In this picture he is swearing an oath that he will be the best puppy ever for his new owners!!! I still have the little Frenchie girl too, I will try to get better pictures of her in the next few days. She is ready now to go to her new home. Several of our pups found their new homes over the weekend including the two discounted schnauzers. We still have quite a few nice pups available for their new homes and the two discounted Teddy Bears are still here. You can check the links to the rights to see what is available at this time. Give us a call if you would like to come and visit. Day Before Easter Sale !!!!!!! We have 4 pups that really need to find their forever home. So, they are greatly dicounted. One female and one male Schnauzer, I usually get $500 for my schnauzers, but if you come out today, I will take $250 each for them. They are salt and pepper and great little pups. They are a little on the shy side and I am pretty sure that is why they are still here. But they warm up to everyone quite quickly and the others from the litter that have left have adjusted very well and are not shy anymore. They are registered with Continental Kennel Club and are 12 weeks old. I have also discounted the 2 Teddy Bear male pups that I have available. They are also 12 weeks old and great little guys. These two are the opposite of the schnauzers in personality. They are very social and outgoing and have tons of energy. They are all white and I think that is why they are still here. It seems that everyone that is calling for Teddy Bear wants some color on them besides white. But these two pups are just adoreable. I will take $250 on them if you come today too! Give us a call and let the Easter Bunny bring a pup to your home this weekend. I was able to get some better pictures of the younger pups that we have available now. Please check the links to the right to see! Snapped some new pics of our Frenchy boys this morning. They are so adoreable, I can hardly stand it. Here is one, but click the link to the right to see more! Ok, this is just crazy. I actually harvested lettuce out of my garden this morning. It came back from seed from last year. Boy was I surprised, it was delicious! 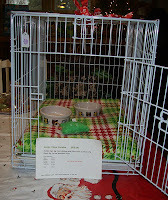 I have posted new pics of the litters that will be available around March 28. Check the links to the right for more info. Enjoy this weather! The pups sure are. They get to play outside every day! Wow, who would think that I could let the puppies out to play in the middle of March. They have all been getting turns out on my front porch to enjoy the unusual weather we are having. I just posted under the links to the right the pups that new litters that will be available the end of March. Although, you don't have to wait till then to get a pup now. I still have quite a few that are ready for their new homes right now. So give us a call and take a drive to the country and enjoy this beautiful weather we are having. I have posted in the past what being on the waiting list involves, but don't expect people to scroll through all of my ramblings to find that info. I keep waiting lists on upcoming litters and all that means (no money involved) is that I take your name and number and you are kept on a list to see the new litters as they come available. If you are second on the list you get to see them second . . . It doesn't mean you are obligated to take a pup, it just means you have a shot at them before others get to see them. So if you see something that you are looking for that isn't quite ready, give us a call and I can explain it and get you on the list if that is your desire. We have had a busy week sending quite a few pups to their new homes. However, still plenty to choose from. I also got a chance to take some better pics of the Frenchies. The boys are ready to go to their new homes now. Our vacation is over and we had a wonderful time. It is time for me to get back into my real life. I can begin scheduling appointments for all of the puppies listed in the links to the right. Anytime Tuesday or after is open to come and meet the new pups. Let me know what works for you! We have decided to reduce prices on three more pups. Two of the chiweenies and the Chorky have been reduced. Check the links for more info. We have decided to reduce the price on the Bichons. We have a litter of 5 and haven't gotten any inquiries. They are wonderful, loving pups that do not shed. When my kids were little, we got a bichon because they are good for people with allergies. It worked out well for us. Check the link for more info on these delightful little pups. New litters of pups are available to be seen today. I am posting pics as fast as I can. Originally due to my schedule I did not think I would be able to start showing them till Tuesday, but thanks to Phoebe and her unexpected birthing, my schedule opened up. So, the pups are ready to be seen and go to their new homes. Check the links to the right. Ok as a little side note that has nothing to do with pups; it has to do with the right batteries for the camera in order to get that perfect puppy Kodak moment. While at Menards (my home away from home) while the kennel is still under construction, I found this great "deal". A 24 pack of Sunbeam AA batteries practically for free, once you send in the mail rebate. So, out I go to the puppy house to snap away. Ugh. I could not even finish photographing 12 pups with a brand new pair of batteries in the camera. Therefore, if you visited the site earlier and some of the links still did not have new pics, now you know why. I just finished trudging through the snow with a couple sets of new batteries in my pocket and got the pics I was missing. Surely, a lesson to be learned. Snapped some new photos of the two female teddy bears that are available. The pic I had did not do them justice. They really are very cute! Check the link to see just how cute they are. First and foremost, we had our very first litter of French Bulldogs last night. It is an unwritten rule of thumb that better be safe than sorry and deliver bulldogs by C-Section. Soooo, she was due on Friday and we had her surgery scheduled. I went out for just about an hour and a half and came home to two pups already born, cleaned and wanting to nurse. Boy was I freakining out. What a trooper our Phoebe is. She would have a few contractions, give about 3 pushes and a pup would just pop out. We had 7 total, 6 boys and one little girl. We will be keeping the girl and the owner of the daddy gets to choose a pup. The remaining 5 boys will be ready to go to their new homes in about 8 weeks. So, if you, or someone you know is looking for a loving Frenchie, tell them to give us a call. I will be starting a waiting list. Here is a pic of Mom and the pups are on the link. On to the rest of the news. The next litters of pups that are available will be ready to be seen and for their new homes this weekend. Shih Poos, Morkies, Schnauzers, Schnorkies and Bichons. I will probably not be able to get pics posted till Saturday, but if you are interested in these breeds, check the links for particulars and give me a call to schedule a time to come and se them. 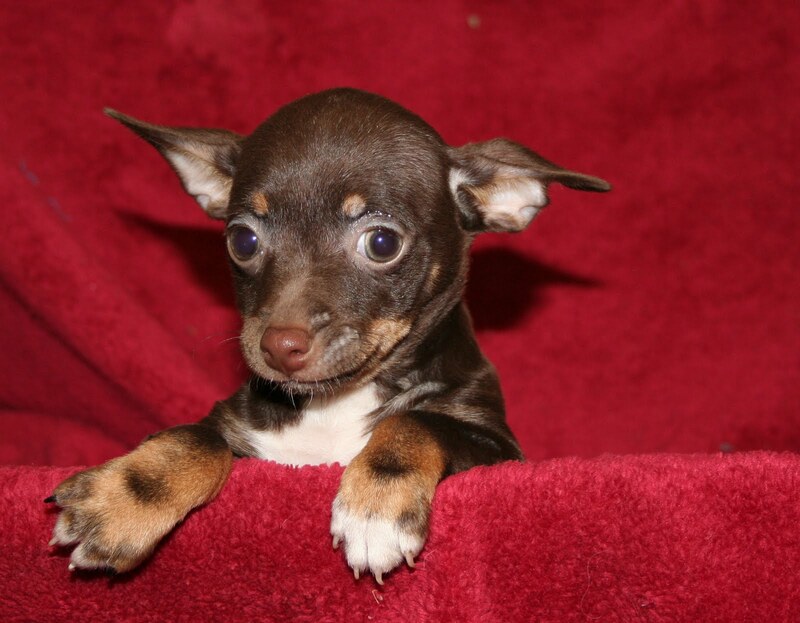 Just got some pics of the upcoming chiweenies that will be able to go to their new home next Sunday, Jamuary 22. One boy and one girl. They are really tiny. The little girl is pictured in the teacup. I think they will be about 4# full grown quite possibly smaller but I prefer to err on the high side. 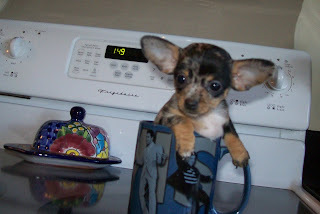 Check the Chiweenie link to the right to see more pics. 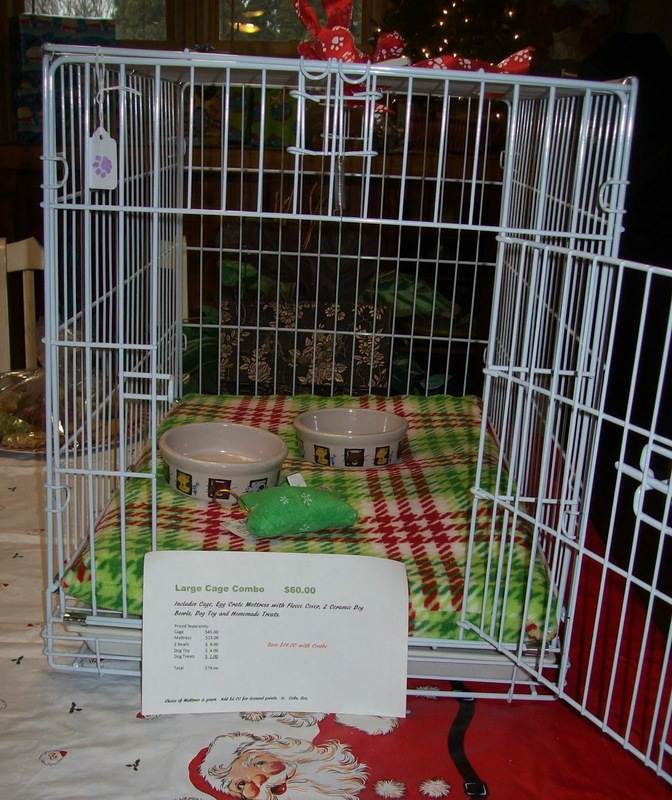 Price Reduction on Several Puppies. We have reduced the price on the Chiweenie, the Dachshund, the Rat Terrier and 2 Shihpoos to just $200.00 each and the female schnoodle to just $300.00. We are hoping that will help you to decide to give one of these pups a new forever home. There is nothing wrong with these pups, just that they are a few weeks older than the other pups. They are loving and sweet and will make great family pets. Let us know if you would like to come and see them. This is a picture of one of the rat terriers. Check the links to see pics of the other pups.